We’ve presented charts and figures for counties and cities regarding collisions with bike riders showing the counts of fatalities and injuries, (in Newport’s case even the degree of injury), and who was at fault for the collision yet there’s still something missing. To better target our educational outreach, we need to know “who are these people”, or who these people are that are colliding or are being collided with on our roadways. 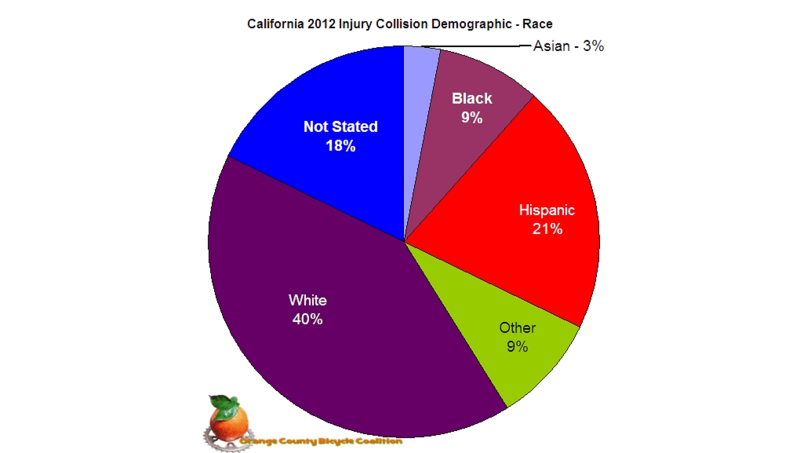 The classifications for race are assigned in the collision record database, and the 23% being “not stated” may indicate shoddy record keeping by the reporting agency in 2010. In 2011 record keeping improved in the county, shrinking the “not stated” to a negligible number (9). While it would appear that Whites either quit riding their bikes and causing collisions, or previous educational efforts are bearing fruit, we suspect more of the latter than the former. 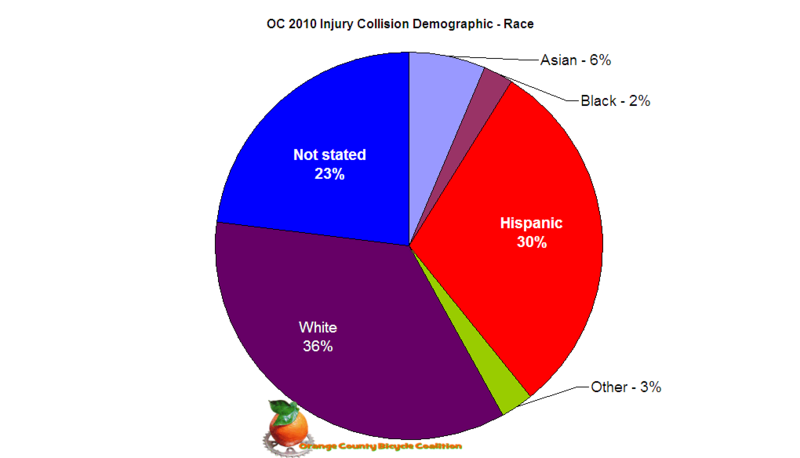 Obviously the largest jump in colliding riders are the ones identifying with the Black and Asian categories, with a slight decrease in the Hispanic and Other categories. 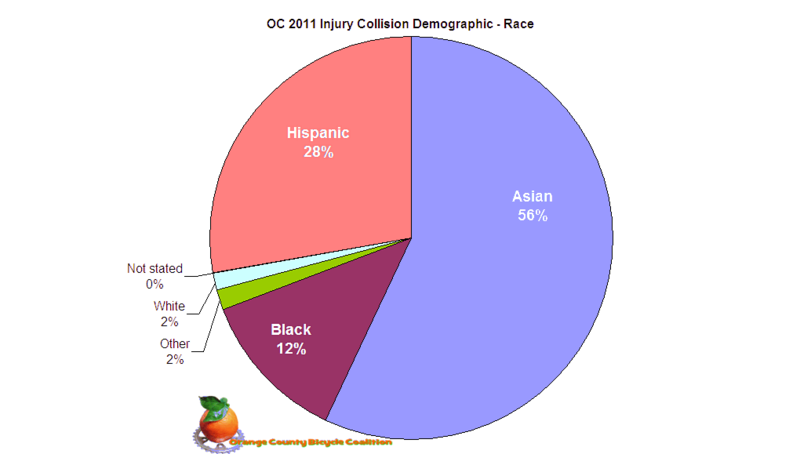 So far for 2012 there aren’t too many records from Orange County with demographic information. As noted in an earlier post, some PDs are better at taking care of “administrivia” than others in getting their paperwork submitted in a timely manner. We also found that collision demographic data lags the actual collision record submission such that there may be a collision record with 2 parties injured, yet the party record is not there! This might be something you’d expect to see from a state wide coalition like the CBC or even CABO, and while we can, it’s far beyond our charter to do so and this was done just to see if we could. Since you asked, yes we have the city by city breakdown for the county, and they will be contacted regarding educational outreach efforts. On the other hand they are always free to contact us! All collision records are collected and maintained by the CHP SWITRS (Statewide Integrated Traffic Records System) database. There are actually 3 parts to the complete information record: collision, party, and victim. The record caseid (a unique identifier) is what ties the 3 segments together and we created a way to allow party information to be tabulated by any criteria we choose within the items contained in the database. The process is time consuming and a lot of checks and balances are built in to avoid record duplication or omission, however that is part of the value-add provided by the Orange County Bicycle Coalition. Your membership and donations help fund this effort, thanks for your support! This entry was posted in County News, Education and tagged injury, ocbc, road by Pete van Nuys. Bookmark the permalink.